In September 1st I started a new online class developed by Beth Morey. 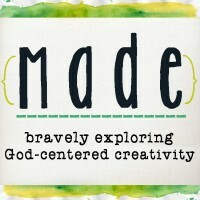 It is called made. We are on week 2 at the moment but it is one of those courses that you can take at your own speed and so you can never be behind! And I have met such a lovely group of supportive people on the Ning forum and the Facebook group. Some are online friends from other workshops and some are new but feel as though I've known them a long time. It is a very safe place. I haven't shared week one with you because I haven't done it. My head wasn't in the right place last week to answer the questions so I did some other journaling instead. So on to week two. This week's class was provided by Megan Armes. And we were shown a bookbinding technique to make our own journal. Regular readers will know I love making small books so I loved doing this. I had done some pages on brown paper when I was doing a Roben-Marie Smith online class. We were to use Manila folders but I didn't have any so used brown paper instead. I also found some of the gelli prints I had done which are mostly on thin card. I thought I'd add some sketchpad paper. I followed Meagan's instructions and here is the inside of the finished cover. Here's the outside cover - this is also a paper made on Roben-Marie's course. Here you can see how I had sewn the signatures and then attached them to the cover. Here you can see some of the inside pages. Just have to decide what I'm going to do inside it! Bernice what a stunning journal! Your art pages are lovely. It will be great to see what you do with each page. I am in MADE as well and haven't done this yet. Looking forward to it. I'm way behind in my blog reading, but I had to stop to say how much I love these pages! That looks so colourful. Have fun filling your new journal Bernice.